Rindler Creek flows out of the hills to the east of Vallejo, down into Lake Chabot. It attracts a fair amount of trash, unfortunately, and it’s time for a spring cleaning! We’ll meet at the corner of Fairgrounds Drive and Coach Lane. Wear sturdy clothes and shoes, glove, hat and sunscreen. We will provide tools, trash bags, water, and refreshments. To RSVP, email Info@VallejoWatershedAlliance.org. April is teeming with events! The Trustees of the Vallejo Sanitation & Flood Control District are delighted to honor the Valljeo Watershed Alliance for ten years of watershed protection and enhancement. All are welcome to join us for a brief presentation. Saturday, April 16, 9 a.m. to 1 p.m. — Downtown Vallejo Farmers Market, Marin Street between Georgia & Virginia. Plan to come down to the Farmers Market on Earth Day and have tons of free fun! The Alliance will be bringing critters from Lake Chabot in touch tanks, and have lots of other information besides. There will be face painting, jugglers, music, kids crafts and much more. 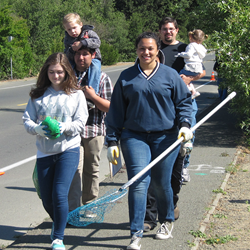 In partnership with Solano County, the Solano Resource Conservation District, and many others, the Alliance is hosting a cleanup along Blue Rock Springs Creek. Park at the Wardlaw Dog & Skate Park; follow the path behind the dog park and cross the bridge. Wear comfortable clothes, sturdy shoes, hat, gloves and sunscreen. We’ll provide the tools, water and refreshments. To RSVP, contact Doug Darling at ddfish4life@sbcglobal.net or call 707.373.1766.